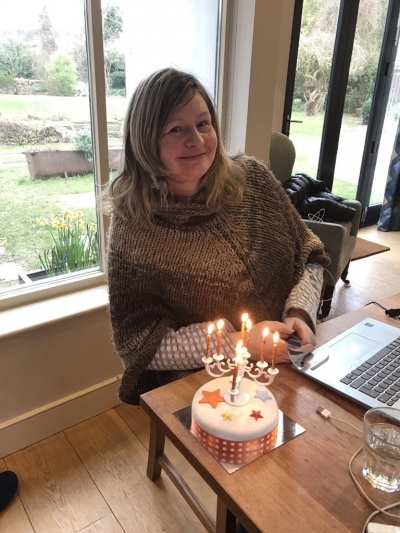 After a break for Easter, it's time for Kirsten's monthly round-up of what has been going on in her writing life. Here is her look back at March. Yes, March was (finally) the culmination of the past six months’ editing. All that work, the hopes and dreams, the fun and excitement and creative endeavour. All that agonising, all those doubts, the slashing and burning, the venting over family and friends. And please don’t even get me started on the synopsis!! At the end of the day, it really all comes down to a handful of emails, doesn’t it? 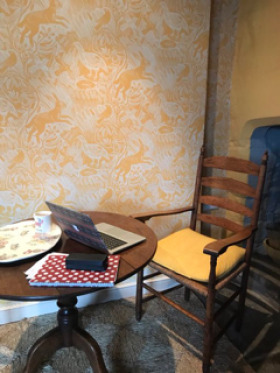 As the self-styled queen of procrastination, I set myself a deadline and decided that I would submit while I was on a retreat with the fantastic Place to Write. 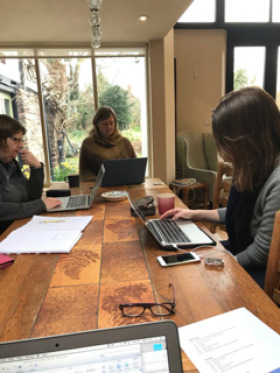 I’ve been on a couple of their retreats before, indeed I have become good friends with the wonderful Moira and Jane who run it, and as I mentioned last month, I knew there would be fantastic food and cake and tea and wine and support and encouragement. I got all that in spades. 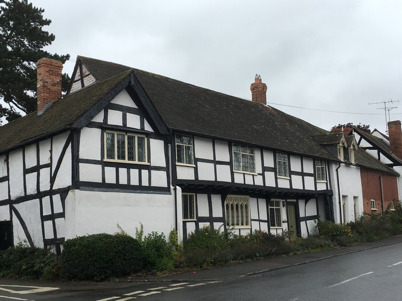 It was set in fantastic half-timbered house in Weobley complete with secret Narnia cupboard and lots of lovely nooks and crannies in which to write. Not only that but there was the best yoga session ever, complete with chocolate buttons (I know!) and blankets. I didn’t drop off - honest. There were laughs galore devising covers for possible - but highly unlikely - future projects (and I’m looking at you very severely here Christine Manby!!) There was also this lovely birthday cake complete with fabulous candelabra candle! What more could an aspiring writer ask for? I worked hard all retreat, polishing the manuscript and synopsis and getting rid of surplus that’s, justs and anyways. (There were lots of them. Nearly enough to fill a novella!) It all took longer than Id’ anticipated and I ended up working in bed until 4am on the last night and still not quite finishing but it was worth it …. Two days later, I was ready to press ‘send’. Such a gentle, almost anticlimactic, culmination to all that work. And once my submission had gone, I noticed the typos …. So, now the waiting starts, I am resisting the tempatation to press send/ receive all the time. OK, I am sending send/ receive all the time!! And also trying to get on with Book 2. I’d like to say a big thank you to Jane Ayres, Julie Cordiner and Chris Manby who were kind enough to read the full and to give me their feedback and to all the LLs who helped so much with the synopsis. I hope you all have a great April and may all your writing dreams come true. Thank you Jen. And for all you kind and generous writerly support throughout my journey. I really appreciate it! And now I have an agent!! Squeee! Wow! So many comments. Sorry not to have been around to reply - this has been a day-job weekend for me. Chris, Tara, Karen, Jane, Charlene and Cath - thank you all for visiting Kirsten's blog and leaving your comments. Sounds like a great retreat and month! Congrats on hitting send! It sounds and looks like a wonderful, cosy and supportive environment to complete your manuscript. My fingers will be tightly crossed for you! Wait, yoga with chocolate buttons! I wouldn't mind giving that a go. The retreat looks amazing. I'm very jealous. Sending all my best wishes for happy emails in April. Jan and Julie, how lovely to hear from you. Thank you for sending Kirsten your good wishes. I wasn't on this retreat, but I went to a previous one run by Moira and Jane at this venue and it was superb. I am hoping to go on the next one. Keeping my fingers crossed for you, Kirsten. You are a talented writer and I'm sure it's only a matter of time before you are snapped up by an agent and then a publisher. Wish I could have gone to the retreat too - I'm obviously at the wrong end of the country! A great post as always, Kirsten and Sue. The retreat sounds wonderful. :-) You seem to have been very thorough with your editing and more than ready to start submitting, I wish you loads and loads of luck! Catherine and Maddie, you are amazingly quick off the mark. No sooner did I publish this than you pounced on it. Kirsten's blogs are always very popular. I wish I could have been with you at the retreat, Maddie. Perhaps next time... Thank you both for commenting. Happy Birthday and congratulations on pressing the send button. Fingers crossed that the emails land on receptive desks.